Hello my lovely people out there!!!? 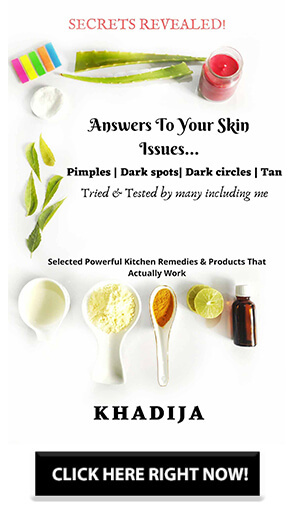 Blending Ayurveda, the oldest Indian indigenous medicine system with new age technology, Jovees offers range of products that have, over the last 12 years delivered on their promises. Price: Rs.265 for 30g. Only one shade available. A daily use lightweight foundation with SPF 15 and enriched with Argan Oil, Olive Oil, Vitamin E and other precious natural ingredients that shall help improve skin radiance, shall create an even, uniform tone to the complexion without clogging skin pores all through the day. A hydrating formula that will also function as a moisturizer and shall protect skin from harmful polluting substances in the environment. Method of Use: Apply tiny dots all over the face and neck, blend them well into the skin for desired results. How is the consistency and texture? The consistency of this foundation is neither too thick nor runny. And it is creamy and soft in texture. How is the coverage and blending power? So the major thing which I and many of us look for while purchasing a foundation is their coverage. This silk foundation has a very sheer coverage. When worn on the face it gives a finished look but doesn’t cover any blemishes and under eye dark circles. I would tell it is more like a BB cream with light coverage. Now coming to another important aspect, this silk foundation blended easily on my face. I tried it in the same way as it was instructed that is applied tiny dots and blended with my fingers. But it gave me a patchy look around my nose. Then I took my damp beauty blender and blended in all of those patchy areas. And yes if you have an oily- combination skin like me then do not forget to use a primer prior to this foundation. 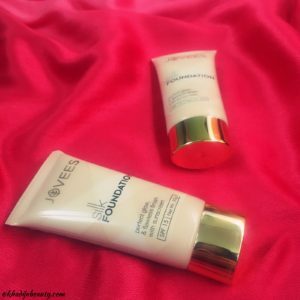 Because I tried it for the first time without primer and this silk foundation settled into my pores and it was visibly seen. So it didn’t give a poreless finish without primer. 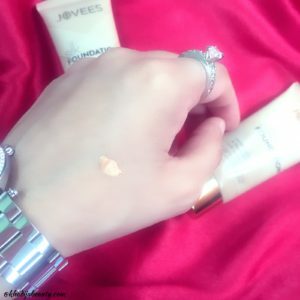 If you have a normal skin then this foundation will look great on you. 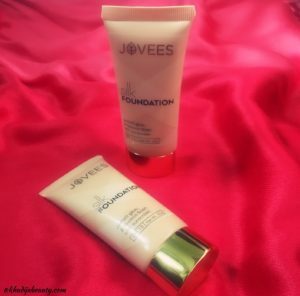 How is the final look & what is the staying power of JOVEES silk foundation? As I mentioned this silk foundation is very creamy, it gave me a dewy finish but didn’t cover my spots. I would suggest you to first blend it with fingers and then remove the excess with a damp beauty blender. Because when used directly with the beauty blender the coverage is even lesser than when blended with fingers. And oily skin people need to set it right away with compact or with loose powder else the dewy look will turn into an oily look. If you use compact over this silk foundation the final overall look will be better. Even after setting the foundation with powder, my face turned oily after almost 30 mins. And it stayed in my face hardly for 2 hours. I was happy that it didn’t give any patchy look to my face when it was melting. I have used foundation which turned patchy and looked horrible while melting on my face. So this is something about which I am satisfied. The foundation melted around my T-zone and disappeared after two hours or so. This silk foundation can be very easily washed off with water, hence not waterproof. Maybelline New York V-Face Duo Stick- Review| Define Your Face With This! 4 WAYS TO REMOVE MAKEUP- BEST ALTERNATIVES TO MAKEUP REMOVER FOUND! This is definitely not suitable for oily skin. 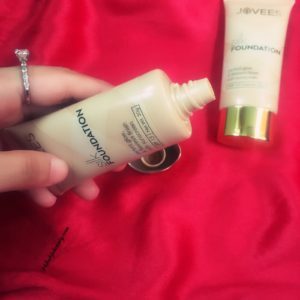 If you have normal to dry skin then this JOVESS silk foundation will last longer and will give your face a dewy finish. And last but not the least the formula of this foundation didn’t cause any breakouts on my face. That is guys. I hope you liked it and this post helped you out. If you have any queries feel free to ask in the comments section below or mail me or DM me on Instagram. If you liked this then please follow and subscribe me and stay tuned for more such posts. I have oily skin so that’s might not work for me . But I think they should consider it as a BB cream rather than foundation as they have only one shade and not great coverage . No No, it is better than that. Not quite impressed with the product. Wish it could have done more. Seems like a good foundation for ppl with nornal skin and most importantly, it is very affordable.